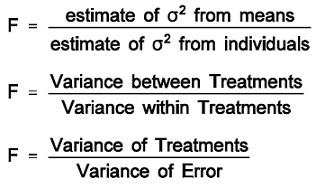 The standard deviation is represented by the symbol ᵟ and variance is square of the standard deviation. Calculate F Test for given 10,20,30,40,50 and 5,10,15,20,25. The F Test value is 4. The above worksheet help you to understand how to compute F Test calculation. When you try such calculations on your own, use this F Test calculator to verify your results.